Bright stockings are hung on the mantel with care ... we can name them all, for a treasure so rare! 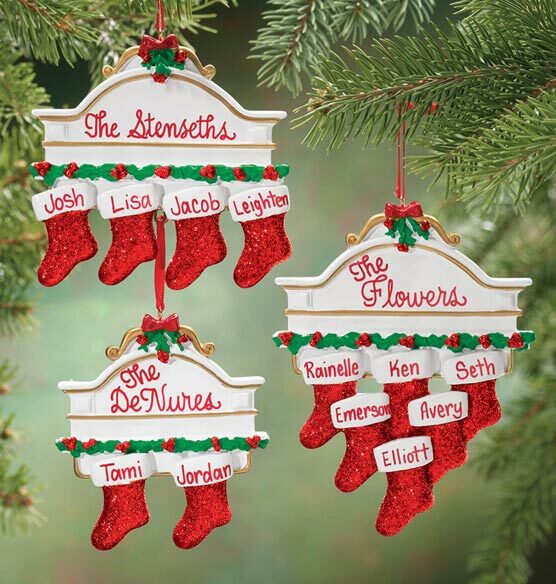 Deck the mantel of this stocking ornament with up to six personalized stockings. Specify name/message for mantel; 1st line, limit 10 letters/spaces; 2nd line, limit 14 letters/spaces. Specify 2, 3, 4, 5 or 6 names for stockings; limit 8 letters/spaces per name. Resin. The work on these ornaments by this company/person is beautifully done. They are just adorable!! I usually buy personalized Christmas ornaments for my family and have found that Miles Kimball comes through when it comes to the quality and price. It was more beautiful than the photo. The ornament exceeded my expectations. It was well made, the names very legible and it sparkled. I liked the ornaments. I ordered them for my family to remember this year. They loved them. I bought two of these as gifts for Christmas. They are really cute and will make great keepsake gifts. This ornament was even nicer than I expected. I couldn't be more pleased. Price is great, so reasonable. This made a great gift for my son and his family on the night they decorated their tree! Wwhen you compare the price, you'll never find personalized ornaments that are so lovely. A great family ornament. The kids love it and it looks great on the tree. I ordered 2 of these products as Christmas gifts. They were received after Christmas but it was my fault, so the recipients will still enjoy them next Christmas. What a Treat and a Treasure! [...] This personalized ornament for family members and their pets was happily received on Christmas Day. It is a keepsake and a treasure for them with the year, their last name and family member names on the stockings! What a joy for us to give this year. Definitely one of the most fun Christmas gifts we gave this Christmas 2010! This was a gift for for someone with 3 pets. They were thrilled with it. It is now their new favorite ornament. I'm so pleased with the way it turned out. I do recommend this. I give a tree ornament, with year stated, to my Wife. Adds up to decorate the whole tree with many loving years! We purchased this item to give as a gift to the host & hostess of our family Christmas gathering. It was so well liked that others asked where we got it, so they could buy one. Or Hint, Hint We may have to purchase several more for next Christmas. Bought these personalized ornaments for our out of town family members. They can open this a week before Christmas so they can enjoy it. They will love the ornaments. Better than expected. Good job. Sent this Christmas ornament to our troops in Afghanistan. Personalized: "National Guard USA"
I was really surprised how big this ornament was. It looks very pretty on the tree! I am very pleased with it. Loved the free shipping! Great value! Loved this on our tree! well made, beautiful personalization! I bought one for my family and it was so gorgeous I bought another for my in-laws! I buy a personalized ornament every year from Miles Kimball. Great way to make memories and decorate the tree. Love them all. My sister,niece and nephew will love this ornament. looking into getting one next year for me. I think Miles Kimball has the best Christmas ornaments. I buy Christmas ornaments for my grandchildren and great-grandchildren & they always love them. I love that I can get them personalized. The prices are reasonable also. I gave this as a gift. The Family Loved it. 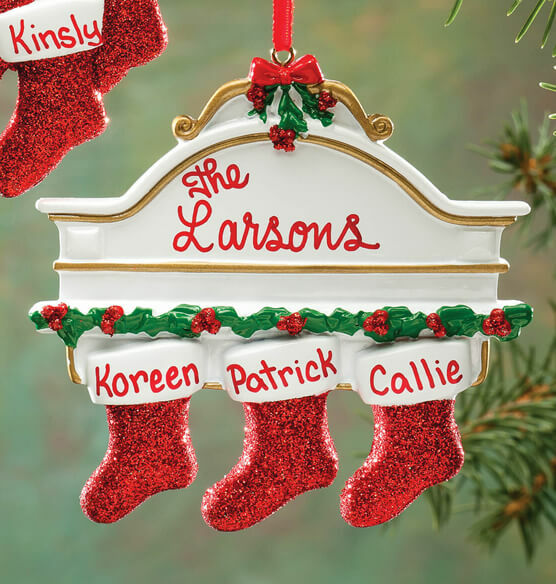 I order my personalized family ornaments every year and am always extremely pleased; can't beat the price. I bought 3 of these. These are so adorable. I love them and would buy again. This ornament is adorable and well worth the money. I would highly recommend it to anyone who wants to purchase a personalized item for a family. This was a very pretty ornament. The kids really liked it and the glitter was so prominent. The only thing I wish I had done different was to add the year. I assumed that it would be on there and I was wrong. Please note that these are personalized...not customized. If the names are spelled unusually, you will have to email with the spelling and have them customized. I'm a long term shopper of Miles Kimball and order products threw out the year. Very satisfied. This was a gift for my brother's family. When my 10 year old twin nephews saw it their words "look it's all of us". Think my nephews were more excited about it to all family members names on the ornament. I placed a very large order for personalized ornaments on the 15 of December 2011, doubtful that it could be fulfilled by Christmas, and it was delivered through an expedited service, without my paying extra, and was at my door on the 22nd of December. I could not be more satisfied with your service and the quality of the products were fantastic. I get a special ornament each Christmas for my daughters. I believe this is the prettiest one yet. I was amazed when I saw it. Many of my coworkers liked it so much they had me order one for them. The stockings were hung by the chimney..
Adorable Christmas ornament! A keepsake, for sure! My sister didn't want anything for Christmas. Then I saw this ornament and knew it would make a great family gift. It has each family members' name on it. A unique way to include all family members on our Christmas tree. I LOVE THIS ITEM. VERY ATTRACTIVE, EXCELLENT PRICE. ARRIVED IN A VERY SHORT PERIOD OF TIME. WOULD DEFINITELY RECOMMEND!!! MY FAMILY LOVED THIS ORNAMENT! IT WAS DISPLAYED ON MY DAUGHTER'S FACEBOOK PAGE. Bought as a gift. Really nice! Bought 2 of these for my grandparents that has there GREAT grandkids names on each stocking! I think they will love them. They look so good. Good size. maybe a little heavy for a tree. Can't wait to see them open it! A gift for my grand-son and his family. I think it is one of the cutest items I have ever bought! Know they will love it. Beautiful, personalized, tree or mantel ornament for Christmas. I was very pleased with the ornaments, I gave as a gift, made it a family gift, something for everyone in the family. the children enjoyed seeing their name on the socking. This ornament is a gift for my son and his family. It turned out just like the photo and I'm sure he will be delighted. It's high quality for a great price! Christmas gift for my son and his family. They will enjoy it. I ORDERED 2 OF THESE ITEMS, FOR MY DAUGHTER AND GRANDDAUGHTER. ALTHOUGH THEY CAME AFTER CHRISTMAS, I'M SURE THEY WILL BE PLEASED T USE THEM ON THEIR TREE NEXT YEAR. THEY ARE BEAUTIFUL. 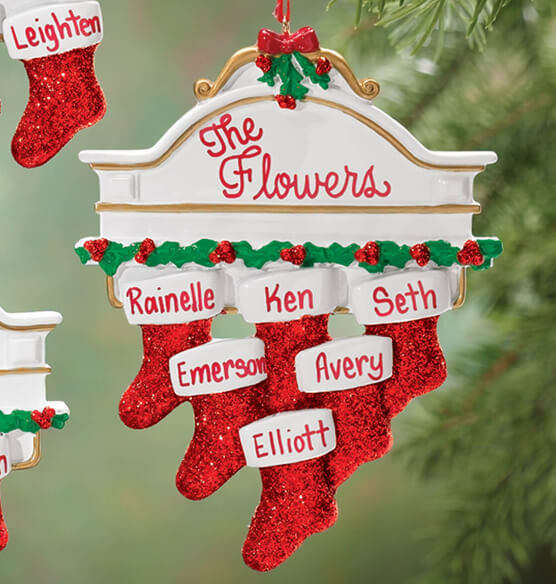 I bought these to hang on our tree since we moved away from our kids and grandkids however they were so well done, the writing of the names so professional and so adorable that we hung them on stocking holders where anyone coming in our home would see them. My husband was completely surprised at the attractiveness of the ornaments. My friend loved adding the ornament to her collection. Especially since it was personalize. i HAD THIS SENT DIRECTLY TO MY DAUGHTER & SHE SAID IT WAS VERY PRETTY! tHE PRICE WAS RIGHT & vERY NICE GIFT! i have an ornament w/ the year and names on them from 2010-2015 that when we got the apartment together. This ornament was purchased as a gift for my son and his family. He will be adding it to his keepsake ornaments on his Christmas tree this year. It is a very attractive, bright colored ornament. I know the repients will be happy and pleased to have the personalized ornament for many years to come. I bought one for our own tree and one as a small gift for each of my son's families for the top of their Christmas trees...something they each will always have to remember us every Christmas, even after we're gone, since we all LOVE Christmas! Looks very pretty near the top of the tree! These ornaments were beautiful. I ordered 6 of them for my family's families. They were perfect. And they came so quickly. I highly recommend them. We tresure our hand made stockings from my grandma that has passed away. This was a beautiful keepsake to honor my daughter's first christmas as a mom! She just LOVED IT!!!! I love the ornament. They are so cute and personal. My family will love the ornaments as I do too! Great for any size family. My grandchildren have more letters in their name than the spaces allowed. Ordered this for my dad for xmas and he absolutely loved it. Very cute item. Shipping took over 2 weeks with no tracking updates. 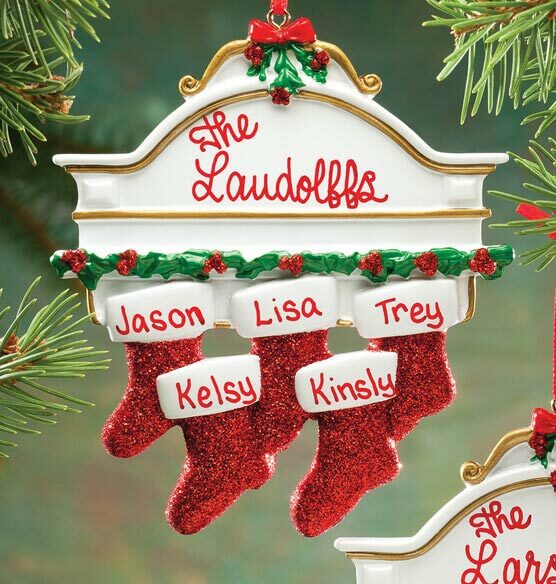 I normally trudge to the Mall to get these ornaments and have them personalized. This time, I saw these cute ornaments and they did a great job personalizing them and they were less expensive! I used this for the name tag on a Christmas present for a set of sisters and then again for a set brothers. It was great and accomplished just the effect I was looking for. The only reason it did not get five stars is the price. Good quality and appearance. Recipient was pleased. Every year I get an personalized ornament for the family at Christmas. I was pleased at how nicely this turned out. My sister didn't want anything for Christmas, but this ornament was for the whole family! So Cute! Perfect Size for Tree!!! The names were written neatly and the ornament turned out very pretty! I was pleasantly surprised because I somewhat expected it to look cheap - it doesn't - it actually looks like it could be procelan - I Love It! My daughter loves personalized things that have to do with her family. When I showed her what I had made for her she absoluely loved it. One product for entire family. It fit my requirements and they are pretty. I wanted to order a personalized ornament that was for all my kitties. Cute styles and fit my needs. Can this be overnighted for tomorrow? BEST ANSWER: Thank you for your question. Personalized items need two additional days to arrive. We hope this information will be of help to you.